I actually can’t believe it’s been a whole year since I landed in Australia! It’s been an incredible experience from start to finish, and the includes my short time in Hong Kong just before. I can honestly say that this has been the best decision I’ve made since graduating university back in 2012. It hasn’t always been easy, and there are times I felt pretty low, but I’ve gotten through them and I’m glad I didn’t give up. I have to thank everyone who helped me, no matter how big or small, get through the struggles. I’m still learning, and still looking forward to seeing and doing more, but this seemed like a good time to revisit some of the trip, partly for you but mostly for me. Help! 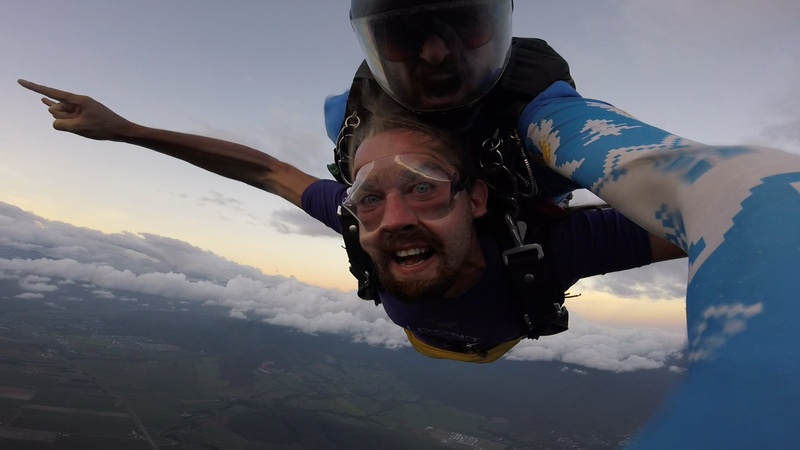 I’m falling out of a plane! Given my disliking of heights, falling from 15,000 feet doesn’t sound like something I’d enjoy but it was amazing! Even better, it was at sunrise! Getting over the initial fear and settling into it allowed me to enjoy the views and sensation. Would do again. It might not be the best sunset ever, but the place is stunning and the water, the hills, the lighthouse – they all add to the effect. This was just after surf camp so I was already on a high from that. I also got to catch up with an old friend, so bonus. This is a dream getaway with koalas, wildlife and beaches. The island is small and scenic – you can walk across it and back in less than a day, but there are a lot of hills. I could have done with more time here but I was able to recharge my batteries, hug a koala and get some great views, too. Before I left, I promised to share the good and the bad, and there’s been a few lows along the way. This hit me hard at the end of my east coast trip. I had gone almost six months without working, other than bits of freelance, and had run out of money. I survived a little longer before taking the plunge and coming back to Melbourne, which has proven to be the right decision. I got so low that I almost decided to come home before and after this decision. I’m glad I didn’t but I found it hard to stay motivated when I felt like I couldn’t catch a break. Lessons were learnt, though, and I won’t get in that situation again. There have been a few times that travelling solo has hit me. This was most obvious when I had no money and no job but every so often, despite being a solitary person who likes my own space, I’ve missed being around people I know – and other backpackers don’t really count. I miss people from back home and the familiarity and security they offer, even if only for a short while. Working full-time can be quite mundane. After arriving in Melbourne, I got a bar job in a music venue. Easy enough but good fun. I also started working in the hostel I’ve been staying in, mostly doing nightshifts. That was different for me but ruined my body clock. Eventually, I got a full-time 9-5 back in digital marketing. It pays well and I’m using this chance to save as much as I can, without living a boring life in Melbourne. There are definitely worse jobs out there, though. Hands down, this is one of the most beautiful things I’ve ever seen. I’m sorry there’s no picture but they were breath-taking and I’d love to see them again. Fraser Island itself is also one of the best things I’ve done in Australia. It’s so serene and beautiful, but dangerous at times, too. 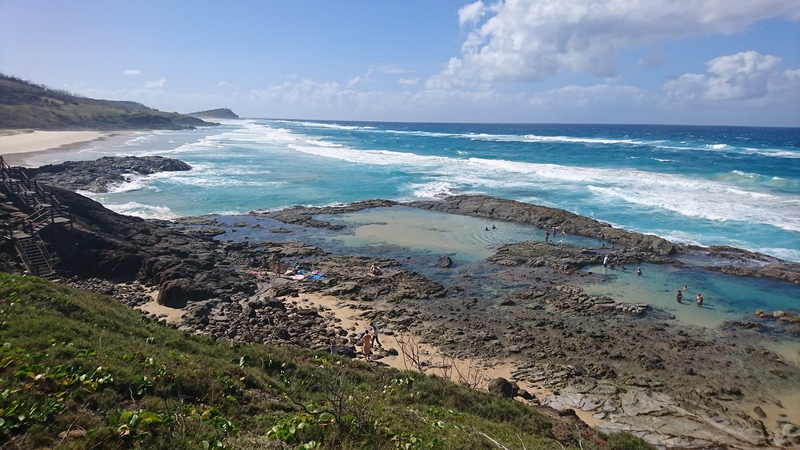 Gorgeous lakes and rivers, champagne pools and a rainforest all on one sand island. The F1 at Albert Park was fantastic! The race itself might not have been the most exciting but seeing it somewhere else for the first time was something else – and it was so cheap to do! Surf camp was so much fun, and I really would like to do more surfing over the next year. 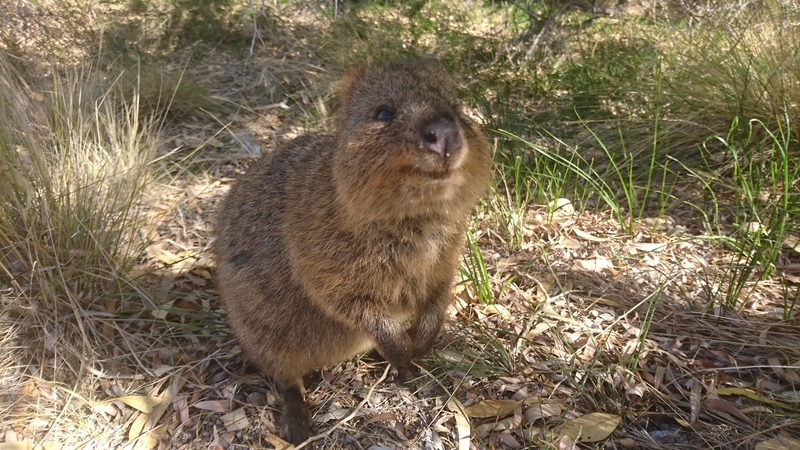 Visiting Perth to see a friend from Manchester was awesome – I had my own tour guide! We saw dolphins, penguins, quokkas and much more. The whole east coast trip was incredible, and something I can’t wait to experience again, kind of, when I do the west coast! From Spot X to Byron Bay was only a four-hour Greyhound journey – simple compared to the last two, right? My bus was at 3am! The 7am was full, ugh. That being said, it got me into Byron just before 7am and that gave me a full day to explore (after dropping my gear off at the hostel again). Although, the driver kept talking into the microphone throughout. Not cool, dude. Not at that time! Now, Byron Bay isn’t huge but it’s full of independent and boutique shops and restaurants so plenty to sink your teeth into. It’s also very chilled out, more so than other place I’ve seen so far but everyone still goes about their day. It’s a calming chilled out and I felt really happy and at home there, despite it being smaller than every other place I’ve lived – or considered living. I also almost got rained on properly for the first time (outside of the F1). A ten-minute downpour that, thankfully, I was already undercover for on the way to the hostel. It would have soaked me to the core in less than thirty seconds but then it dried up in less than an hour. Madness. That night, I met a local, who I befriended in Doncaster many years ago, and she drove me to the Lighthouse for the latter end of sunset. It was amazing. Then we hit a few bars and had a good catch up before I totally crashed out. The next day was even better. 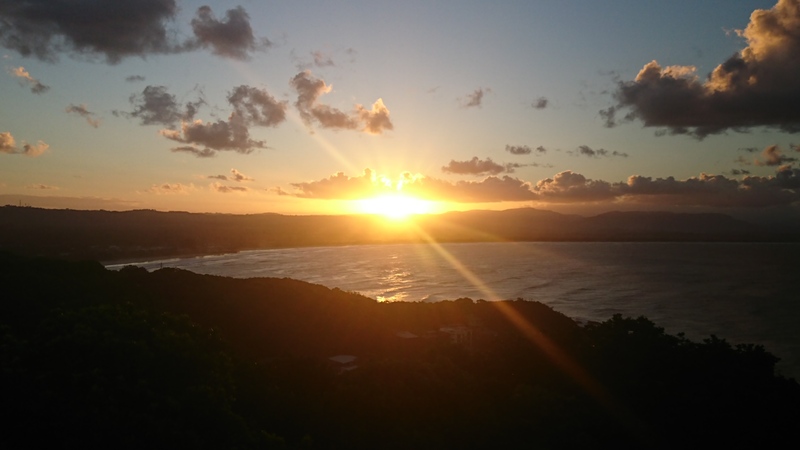 I was taken on a drive around the area, having a look at some of the villages around Byron Bay and stopping at a number of spots and lookouts for pictures. 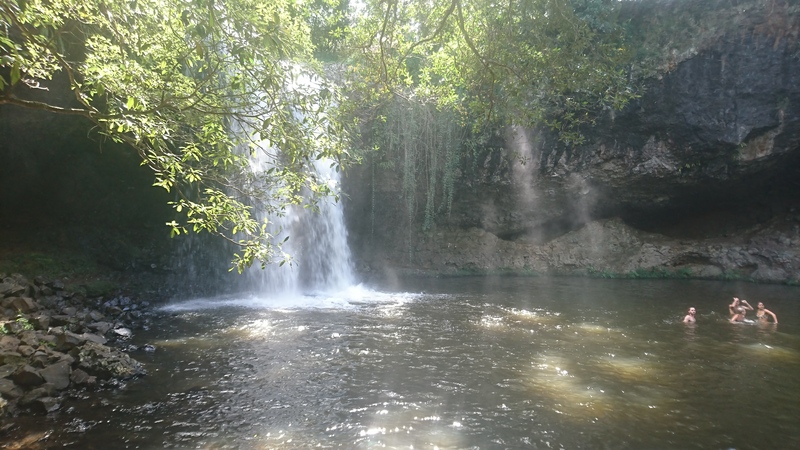 The best spot was Killen Falls, a waterfall after a dam that is part of the water supply for Byron. It was a sheltered cove where people would come and relax in the shade and swim and I’m so jealous I didn’t have my swimming gear – I could have spent all day there! Then again, I wouldn’t have seen anything else if I had! We rounded the day off with more drinks and food in the local RSL club (t’s been so long since I had a roast dinner so it was definitely needed) while watching the Commonwealth Games opening ceremony, a timely reminder that I’d be heading up to the Gold Coast shortly. My final day was spent with friends from Spot X who’d finally arrived in Byron. We took the coastal walk to the lighthouse in the afternoon, arriving with plenty of time before sunset, and seeing the whole thing blew my mind. The colours, the sound of the ocean, the pure peacefulness of it all. I definitely prefer sunsets to sunrises but that might be because I’m already awake at that time! Then it was a short Greyhound to Surfer’s Paradise in the Gold Coast. There’s a lot going on here because of the Commonwealth Games, so there are stages everywhere with music and performances, but it’s also a party area of the city. Great for groups but less so for me, since I prefer pubs to clubs! I spent most days exploring and chilling on the beach (as well as catching up with some work and writing! ), using this time to recharge before next week, which is going to be pretty full on. I did see another friend here, too (met in Doncaster but a local here). We had food and drinks one night and just a really good catch up, which I’m sure won’t be the last one! 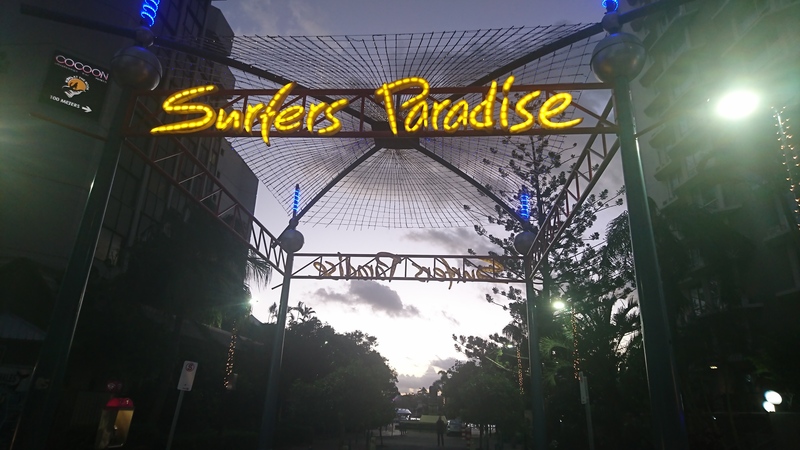 While it’s a nice little holiday destination, there are probably other parts of the Gold Coast better suited for me and in the future, I’ll come back to find them, but taking some time to chill was definitely needed. Also, my body has almost fully recovered by now so when I’m next able to get back on the surfboard, I will!